Loans You Don’t Need: What Type Of Debt Should You Avoid? The other week, I wrote about some risky mortgage loans that became very popular during the height of the housing boom. People took on this debt in order to “stretch” and afford the homes of their dreams at a time when these homes were listing at their highest prices ever. The readjustments that are being experienced in the property and credit markets these days have been very difficult for very many who found themselves carrying these types of debt (imagine monthly mortgage payments reset at $1,000 more than they used to be). If you are a good money manager, these may work out for you, but they’ve been nothing but trouble for a huge number of homeowners who own them. My Thoughts: If you are a disciplined money manager, sticking to the payment plan and ultimately refinancing to a more conventional loan would be good strategy. Personally, I stick to fixed loan mortgages so I can sleep at night and not worry about rate changes. Would you borrow against your house or your retirement account? Securing money this way is a personal choice: there are situations that may warrant this approach, such as when people embark on large, expensive home projects. But I look upon this more as an option of last resort and should be done only if you are absolutely certain you’ll be able to make good on this debt. After all, your assets are on the line and there can be penalties assessed — as in the case of borrowing against your 401K — if you aren’t careful. Note as well that if applied properly, HELOCs and home equity loans can be beneficial with the interest rate deductions they offer, but if things go wrong and if you experience a default, you can lose your house. Just recently, there was a seemingly tragic foreclosure story where an immigrant was scheduled to lose his house due to a $20,000 home equity loan. It was the most ridiculous case of bank debt gone awry that I’ve ever heard of. But the wonderful news here is that the issue was finally corrected after media attention trumpeted this story. My Thoughts: I’m not so sure I’d be comfortable taking on these loans because I don’t trust myself to stay on top of these things. These types of cards are known to carry some of the highest rates around. It’s a bait and switch type of game, where you are “baited” with the promise of an immediate 10% or higher discount on merchandise sold at a given store. You are then offered the chance to open a store credit account to take advantage of the discount. Once you have that store account, you are enticed to keep using it to gain more “store points” or discounts. Note that these cards can carry the highest rates around so if you’re going to use them, pay them down as quickly as you can. My Thoughts: These cards can clutter up your credit and to simplify, you should probably do without them. I do own one such card but I pay off all incurred balances in full and I use it very infrequently. You can either love ’em or hate ’em. Credit cards can be a great convenience, however they come with a price when used too liberally. A sobering fact: credit card holders spend 12% – 18% more money than those who just carry cash. It’s easy for credit card debt to just creep up on you since it feels like you are spending “free money” — convenience and ease of use is a double-edged sword. On the contrary, if you can equate spending with credit as “more expensive” and NOT equal to (or less than) spending with cash, then this realization can prompt you to treat credit card spending more carefully. My Thoughts: I personally love my credit cards — I used to own just one but now I have three of them: one personal, one backup personal and one business card. I pay them in full every month, keeping in mind that spending with credit is not the same as spending with cash since it is *more expensive*. This is a form of leverage than you may at first think is a fine idea since you are attempting to grow your money using OPM or other people’s money. How is this done? Instead of buying stock using your own cash, you open a margin account with the brokerage firm, who then lends you some of the money to buy stocks. You get charged interest on this and worse, you’ll need to cover the cost of any stock that falls in value (to a certain level). So if you’re highly leveraged, you face the risk of losing your investment if the market turns against you and you’re unable to cover the margin call. My Thoughts: A lot of experts say that going on margin is a tactic and not a long term strategy. I’m not sophisticated enough (or foolish enough?) to attempt this at all. Let me start by saying that these types of loans are considered illegal in some states, and I’d imagine this is the case because of the excessive and usurious interest rates that they charge. Up to 500% per year?! They are also prone to unethical and unscrupulous terms and are therefore widely considered as “predatory loans”. However, they are used by people who are in a bind and need cash immediately but don’t have any other way to cover it, possibly because their credit is bad and they’re in an emergency. The cash can be very easy to get, but it is obvious that you pay a huge price for that convenience. My Thoughts: Avoid these loans if you can help it, but if you somehow can’t, fully understand and realize what it will cost you. These are the most expensive types of loans to get, so avoid them by building an emergency fund that can cover 6 months’ worth of expenses. I suppose they have now invented loans for practically anything out there you can think of. Basically, these just sound like your typical loans with fancier names, usually associated with one-time events. Wedding and funeral loans exist because they cover events that are outside of ordinary expenses, which for many, take place with minimal preparation. But there are ways to avoid these high cost loans: go cheap and/or be prepared way ahead of time. My Thoughts: Avoid this type of debt, which I believe are not good things to saddle yourself with during vulnerable times. When you’re starting a new life with someone else or grieving the loss of your loved one, it can be a taxing time of adjustment and stress, and taking on additional debt shouldn’t be something you should be worrying about. Instead, save ahead and go frugal on these events if need be. I take care of big, out-of-the-norm expenses by making sure I have enough savings to cover such eventualities. Because we live in a high consumption society where consumers and credit rule, the temptation to take on debt is ubiquitous, and quite powerful. The pull to consume is strong, with all manners of enticement around us telling us to spend and spend some more. But taking on debt should not be an emotional choice but a strategic decision you make to better yourself. In my book, there are only two ways to handle debt: by using them wisely and carefully, or not at all. Note: This blog may feature ads for similar loans, but my position here is always to take things conservatively and to proclaim: buyer beware. Do your research before taking on the financial burden of a new loan. Yeah, it’s pretty much cutthroat about credit…. use them wisely and carefully, or not at all. If you are not good at taking calculated risks. Do not join the credit game! All loans that scare me. As far as funeral costs go, I really don’t trust the industry anyway and I think it’s kind of ridiculous how much some things cost. So I’ve told my family to donate my body to science or research or whatever. I don’t care if young plastic surgeons give me a facelift (once I’m dead) so long as my family doesn’t suffer an economic hardship for something I don’t need anyway. I have no idea department store cards carry the highest rate around. @Moneymonk – agreed. Best advice is to just not use a tool that you have a hard time handling. Then there’s no risk of a slip up. @Mrs Micah – your request of your family is so honorable. How about having a memorial party instead of a funeral, and it could be as casual as possible… Is cremation as expensive as traditional burials? @David – yes, department cards can sport very high rates. Maybe not the highest ever, but hefty rates do exist. My philosophy on loans is that you should never pay interest on money unless you’re using that money for gaining an even higher return. Most loans fail that test. For example, car loans, pay day loans, home equity lines that fund luxury purchases and so on. The loans I would take out are for education, investment and other such assets that provide me with a return. Even then, I would carefully measure the rate of return, taking risk and taxes into account, before agreeing to the loan. If you’re not getting a return on your money then you’re just throwing money away. So why would I pay interest for the privilege of throwing money away? Mrs. Micah, you probably don’t want to donate your body to science. I have a lot of medical school friends who have told me that they would never ever consider donating their body to science. The type of crazy experiments they do to your dead body will shock you. Thanks for sharing this post on your blog. Well, with regards to “Credit Cards”, I’m perfectly agree with this line (Credit cards can be a great convenience, however they come with a price when used too liberally.). This is true because if credit cards were used unconditionally then maybe that would cost too much. Great list there. 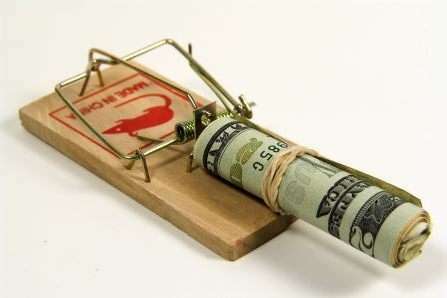 However, I think ANY debt needs serious justification because even 0% APR balance transfers can eventually bite you if not handled properly. Amen. Peple take on debt very casually these days and don’t think to consider that there are things you can actually pay cash for! Who would have thunk? I agree with the points in this post. Excellent post! And overall soooo right on. Department-store credit cards are a rip unless you pay in full every month. But why get one? All those stores accept major credit cards, and many of the national cards give you a kickback on your purchases, so if you do pay in full, you’re not out any cash, you get a little windfall every year, and you haven’t complicated your credit report. Some instruments that might be risky if you’re not alert are useful if you know what you’re doing. For example, my ex- was three-quarters of a million dollars in debt at the time we divorced (the money situation was a major reason for the dissolution of a 25-year-long marriage). Just as our son was entering college, one of the banks called a large loan. To keep the kid in school, I borrowed on margin against every liquid penny I owned and lent it to the ex-, knowing he would pay it back. His mother lent him a like amount. Between the two of us, we kept him out of bankruptcy. He repaid the money, a month at a time, at a higher rate of interest than my lender charged. Thus my savings remained in mutual funds, continuing to earn about 8% overall; my son went to the school of his choice; the ex- continued to pay the alimony that kept me from living under the Seventh Avenue Overpass; and I actually made a little profit on the margin loan. Now that my son is a grown man and earning a decent salary, he and I decided to coinvest in an underpriced fixer-upper. The deal is that I would make it possible for him to get into the shack and he would struggle through the renovations, paint, landscape the huge feral yard, carry enough life insurance to pay off the loan if anything happens to him, and pay a third of the down payment and mortgage, to increase to 100 percent as his salary grows. To finance gutting out the entire thing and rebuilding it, I borrowed $25,000 against the equity in my own paid-off house. We figured the hold time on the investment house would be five to ten years. The trick here is that I DID NOT BORROW ANY MORE THAN I COULD SPARE FROM EXISTING SAVINGS. If push comes to shove and I need to have the house free & clear (theoretically, anything could happen), I can pay it off. The amount the 25 grand earns while it’s parked in investments is more than the current appreciation of real estate, which as you know is overall very weak, and so I earn more on investments than the monthly cost of the equity loan…although of course over 30 years the interest would consume that advantage. If I had not had that amount in savings as a safety net, I would not have borrowed against the house’s equity. If we intended to hold the investment house more than five to ten years, I likewise would not have borrowed for fix-up, because over that much time the loan’s interest would be too costly. Meanwhile, while neither house is appreciating in value as fast as the cash I kept in securities, it looks like a major recession could be in the cards. The money I planned to take from cash flow to pay off the equity loan within three years is instead going into a money market fund that is not invested in real estate instruments. Because my employer recently switched from bimonthly to biweekly pay periods, the two “extra” paychecks that will come my way–which would have been paid directly toward the loan’s principal–will also go into this money market fund. In three years I will have $10,000 more in savings than the $25,000 equity loan. At that time, I hope to retire. Should I choose to move, I probably will pay off the loan from the proceeds of my house. However, assuming the house will be no more salable then than it is now (I do not believe the real estate market will begin to turn around for at least five more years), I can pay off the loan if I think the $170 monthly payment is more than I want to spare from cash flow, or, if I’m moderately flush in my old age, just keep the $35,000 saved by then in securities or, if things are really bad, in CDs. In the Live & Learn Department: The original idea to coinvest in real estate was flawed by bad timing. But it still has the advantage of providing my son a nice (now! ), centrally located house large enough for him to take on a roommate, engineering a cost to him that is the same as the unholy firetrap in the frightful slum where he was renting. I don’t think we will make much profit on it–in fact, we’ll be lucky to break even, unless a miracle happens. Right now the house is worth about what we’ve put in it, but two years’ worth unsold inventory — and counting — is sitting stagnant on the local real estate market. Selling prices will have to drop drastically across the board to move that much property, even if the bad loan situation suddenly improves. If the economy crashes to the point where we lose big even over a decade-long period, the house will be the least of our problems, and so that eventuality is not on my radar. In short, then: assuming no serious, global economic disaster happens, you can use potentially risky financial instruments to your advantage, but only if you’re very careful and you already have enough wealth to serve as a safety net. I think the problem should be addressed in high school. I don’t remember being taught any practical personal finance lessons in school. What a shame since it’s so important to start young making good money decisions. It’s not the first time someone has ruined their future to deal with debt. I’ve had my fair share of bad experiences with payday loans and credit cards. I’d advise anyone to sell your assets before you start buying on credit cards or using payday loans. You will ONLY get behind and struggle even more! yeah of course you have to be careful from whom you take a loan from all the time but sometimes you do get lucky and find those companies that give you a great deal. Just trying to keep things positive.